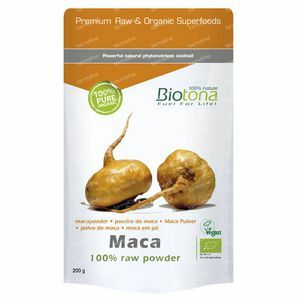 Biotona Bio Raw Maca Powder 200 g powder order online. Biotona Bio Maca Powder originates from the roots of the Lepidium meyenii, a very resistant plant growing on high altitude in the Peruvian Andes, on poor rocky soil in severe weather conditions. According to local tradition, maca is described as an aphrodisiac which is believed to stimulate the performances and general fertility. Biotona Raw Maca Powder is obtained from the organically cultivated maca roots that are manually harvested after an eight month growing period. After having dried, the roots are cleaned and after selection dehydrated and grounded into powder. Maca supports the physical performances, because of a unique composition of several phytonutrients. Dissolve Biotona Bio Maca powder in smoothies, shakes in combination with fruit (juices) or other superfoods, milk, yogurt or as a healthy snack. Limit the use of Maca powder to about one soup spoon a day.